Reaching toward the golden egg is the dream of all groups, associations, and teams. What I call ” golden egg” is to have the same vision one can share. It is difficult to reach it because we all have different dreams and purposes but when they overlap, we are reaching the core of the community. This core, I want to symbolize it with a golden egg. So how did Dennis Luijer, visual changemaker, and me (treasure hunter and more) reached the gold in practice yesterday evening at the Wassenaar’s Art Club called the “Kunstgroep Wassenaar”? Before starting our brainstorm, we introduced a nest. As everyone came in de Windmill coffee corner, they discovered a big empty bucket with moss. The first reactions went from astonishment, surprise and questions. The story begining was set. Of course, we didn’t divulge the secret plan yet. To get focused, I read the poem that was on the invitation. The focus mood was set. Then Dennis started a briefing session showing in pictures what had been achieved this year. The group color was then discussed and seemed far from the purpose created 40 years ago. We all agreed that it was time for a new vision. What are the best symbol for a new vision and a new beginning for a team of free birds like the artist of the “Kunstgroep”? An egg! It is the begin of all, the concentration of all non-formulated potential and desires. Words have a power and when they are written, they are traveling from our minds to the physical world, the world in creation. The world where you and I are the artist. To the surprise of all, we distributed an egg to each one. The mission was to write 3 words explaining why we are belonging to the group. The reaction was delightful: we all could express oneself on the surface of this little egg. 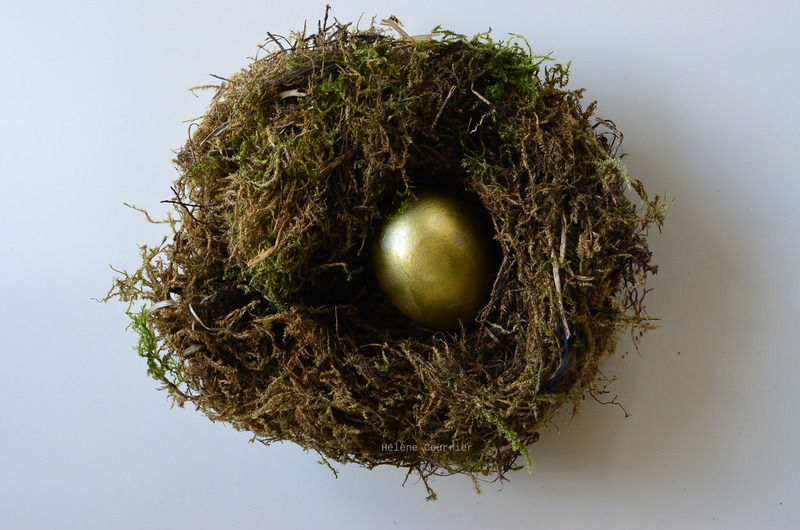 The ritual of putting the own egg in the same nest with the others was a way to put the Same intention in the SAME physical place even if belonging reasons are differents. The fun part of revealing the belonging motivation was a pleasure. Different expressions were gathered in one nest. In the form: some wrote sentences, some draw, some use the whole egg, some were concise. One common recurrent word was INSPIRATION (inspiratie). All eggs had a message of being TOGETHER: “met elkaar- samen-contacten-mensen-gezellig-sfeer”. The first step towards a new vision was made. We then took a break in order to relax the group from the series of rising events. It enabled us to make some few changes in the set to continue our story. We hide the inside of the nest to continue chapter 2. When the members came back from the break they were all again surprised and keen to know what was under. Had the eggs hatched? In which form? What was under? The excitation was at the top: everyone gathered around the nest to see the harvest. The concrete words mixed together combined the good intention towards the “kunstgroup” had created what all alchemist are looking for: GOLD. We discovered the VERY SPECIAL special treasure that belonged to all of us in the “Kunstgroep”: being together for the ART and show it, to inspired and get inspired and to change things for the better. Here is our common meaningful vision and it’s all in the golden egg. As in every good story, an unexpected visitor pop’s up. Ours was a big insect (mei…). It came into the room attracted by the light created by the golden egg. Our exposing artist Brigitte Wawoe succeed to catch it and released it. Our little visitor whispered something that we hadn’t formulated until now: our common desire to pass art and passion to the little people, the next generation, the seeds of our future society. We finished on practical things for the group on which everyone was happy. The last poem was read: Kaleidoscope. Can’t wait to make new stories! Een mooie inspirerende avond voor iedereen, mooi bericht!